It continues to be the numero uno destination for international students. Though China continues to send twice as many students abroad, there has been a whopping near 30 per cent increase in the number of Indian students going to the US for higher studies. The latest “2015 Open Doors Report” of the Institute of International Education, which was released on November 16, 2015, states that students from India and Brazil have shown the largest increase in sending international students. This is the highest rate of growth for Indian students ever since the Open Doors project began data collection in 1954-55. The number of Indian students who went to the US increased to 132,888, up from the previous years’ figure of 102,673, representing a 29.4 per cent increase and accounting for a little over 13 per cent of the total annual international student arrivals in the United States. The number is however far less than China, which has for the first time crossed the 300,000 figure. The increase in Indian students comes after a two-year period that had witnessed a slight dip in the number of international students from India. The increase in Indian students impacted the US in another manner. With Indian students preferring graduate studies, US has also seen an increase in its graduate applicants compared to undergraduate applicants. On the other hand, for the first time, Chinese undergraduate students outnumber Chinese graduate students. While India is the second largest source of students, it is ranked twelfth in receiving international students with only a little over 4500 coming to India for higher education. The low percentage of foreign students in India also impacts its international rankings, since a considerable weightage is awarded by ranking agencies to international orientation. The report does not reveal the reasons for the spurt in student numbers, but it does say that “the last time India grew at a comparable rate (29.1) was in 2000-01 when the number of students from India exceeded 50,000 for the first time”. In the year 2014-2015, China and India provided nearly 45 percent of the total number of international students in U.S. higher education. The biggest surprise is Brazil which has seen a 78 per cent increase in the number of students going to the United States. In number terms, it is placed sixth with 23,675 students. 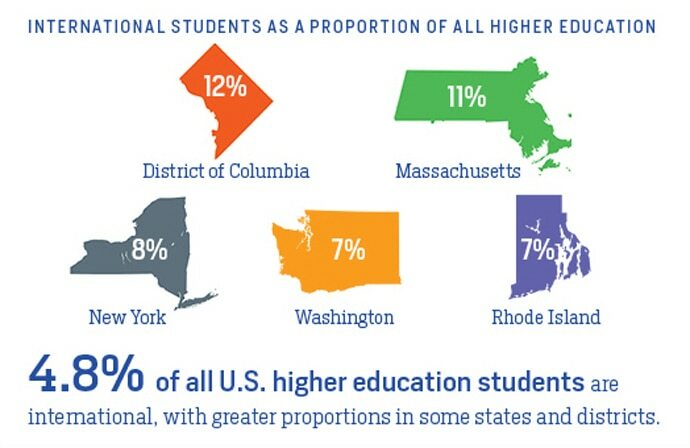 The US continues to be the numero uno destination for international students with a total of 4.5 million students, almost double the number hosted by the second leading host country, the United Kingdom. Italy, Spain, France, and China are the other top destinations for students. Asia continues to provide the bulk of international students with China, India, South Korea and Saudi Arabia occupying the top slots, and Canada coming fifth. 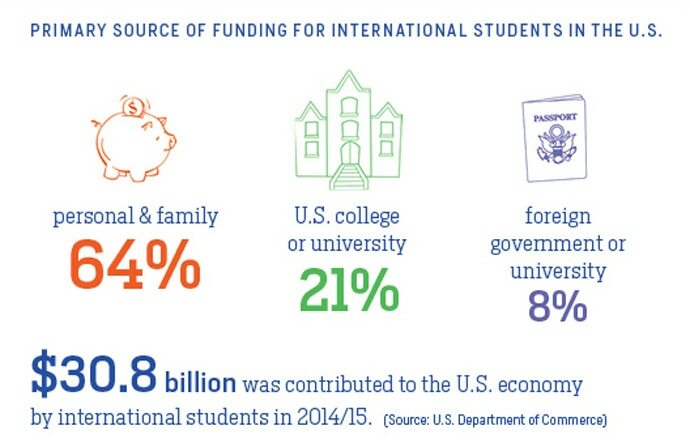 Education is a huge business in many countries, and the US Department of Commerce estimates the country’s earnings from international students at $30 billion in 2014. 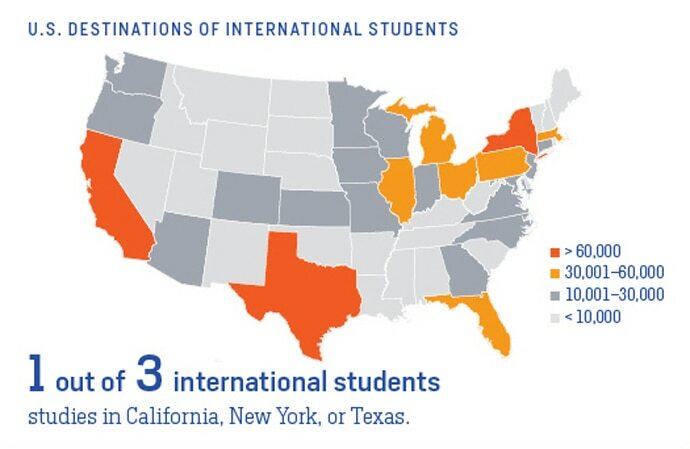 California, New York and Texas are the top three educational destinations within the US with one out of every three students studying in these three states. New York University, University of Southern California, and Columbia are the top universities of preference for international students. 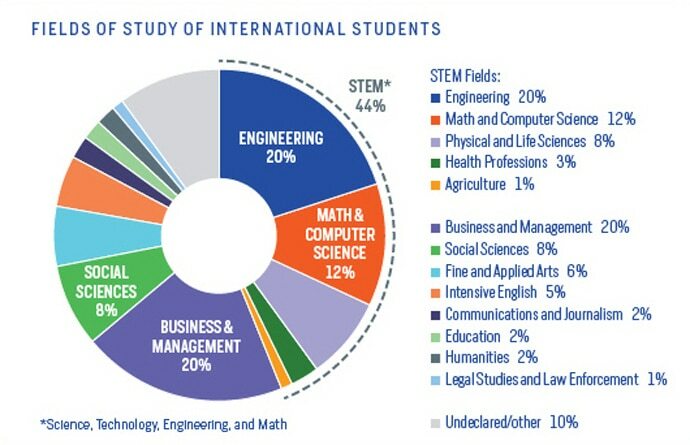 In terms of subjects, most international students in the US opt for business management, engineering, mathematics and computer science, with all three subjects receiving more than a 100,000 students each. The Open Doors report is published annually by the Institute of International Education in partnership with the US Department of State's Bureau of Educational and Cultural Affairs.